This varied itinerary includes riding to turquoise-blue lakes, waterfalls and rapids in the Puelo Valley, as well as crossing a hanging bridge and seeing glaciers and forests. Each night you will come back to a comfortable lodge and the price includes full board meals (including wine) and private transfers. 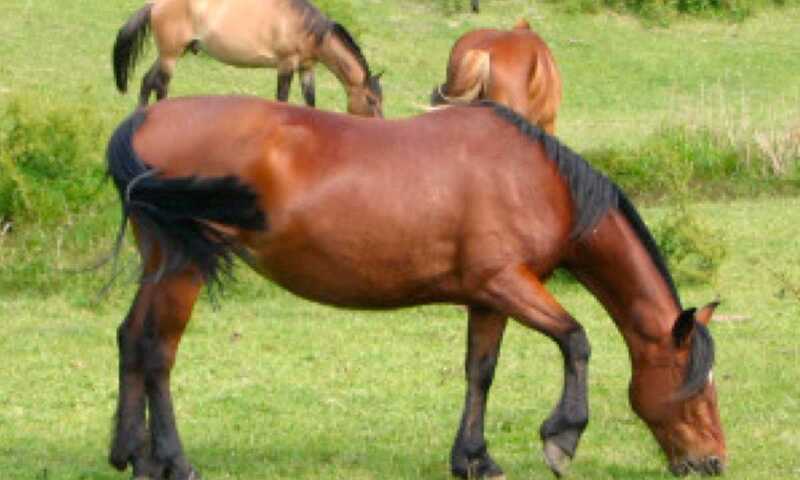 Transfer from your hotel to Tagua Tagua Lake, Meet horses and ride to farm house. Full day ride to Puerto Urrutia and continue to a second farm. Ride into the Ventisqueros Valley, crossing rivers as you go! Cross the Rio Puelo, arrive to the island. Two hour ride to Lago Azul and enjoy a picnic on the shore. Timing: 4 hs by car and approximately 1,30 hrs horseback. The trip will start at your hotel where you will meet your tour leader and driver, load the minibus and drive for three hours, crossing the Valdivian forest along the Reloncavi estuary. Arriving to the Tagua - Tagua Lake. Time for picnic before crossing the lake, a ferry will take us to the other side where will drive for another half an hour. Meet the baqueanos (cowboys) and the horses. Pack all our stuff and off we go! We will ride till we get to the shore of the river. Here the horse must cross swimming, and us on a motorboat. Arrival to our lodging place. 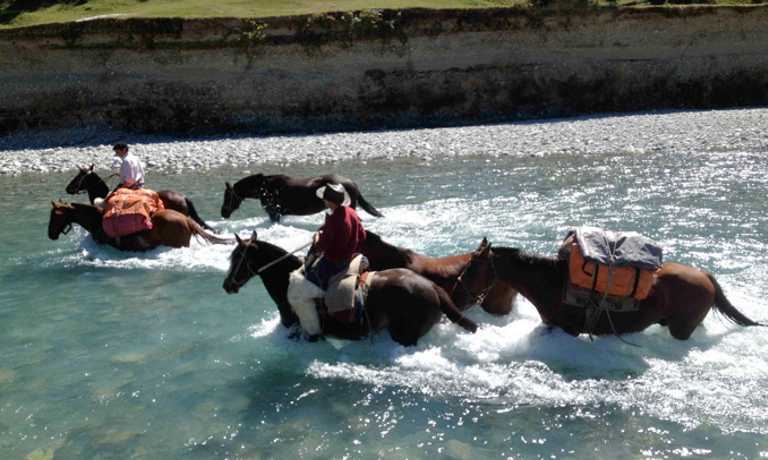 After a good breakfast and organising packhorses, we will start our day riding in direction along the Puelo River. Untouchable ancient forests and straight passes will be our scenery, a wild trail to experience how the first pioneers travelled in the area. Afternoon arrive to our accommodation with a nice view of the valley. Today will be long day riding. Some difficult terrain. 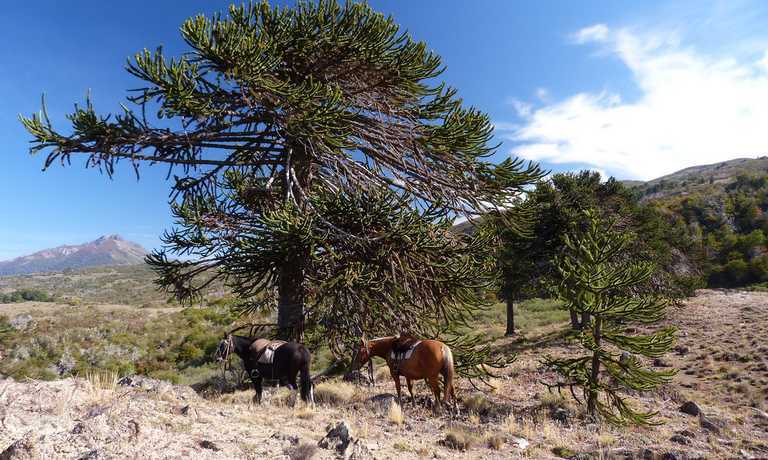 The only way of knowing this isolated and unique corner of Patagonia is by horse. You will continue discovering how amazing they are and feel a close relation with them. In the afternoon we will arrive to a Puerto Urrutia and say goodbye to the baqueanos and horses since tomorrow we will get new horses and staff. From here on we will get new horses and baqueanos. A second team will take us in the last part of this day. Enjoy these fantastic landscapes and watch how the horses cross the river just as the locals do: on a public boat while the horses swim alongside. A half an hour ride to a cosy cottage where we will spend one night. Amazing views of the river and mountains. Timing: 6 to 7 hrs horseback riding. Today, after breakfast and preparing our luggage for the pack horses we will begin our day ride to the end of Ventisqueros Valley. Ride into the Ventisqueros valley where we will stop for lunch and relax. In the afternoon, the ride will get us to a little house where the owners are lodging us for 2 nights. Timing: 4 hrs horseback riding. After breakfast and packing we embark on a gentle full-days ride, crossing the river once more to join the other valley and approach its glacier. This little Valley turns wild and remote, with incredible flora and devoid of habitants. We will arrive close to the Alerces forest on this occasion. Box lunch and ride back to our guest farmhouse. Later there is a chance to go for a walk around the area or simply relax with a glass of wine. Another unforgettable day. Timing: 6 to 7hrs horseback riding. Breakfast and then set off on a full-day ride towards 'la Pasarela del Rio Puelo', an important local hanging bridge. Crucial for the communication between the local inhabitants and the outside world. This area is particularly spectacular due to its huge waterfalls and rapids. Stop for a picnic lunch near the bridge. Ride crossing the wild ancient forest.. We reach Lago Las Rocas. 10 minutes boat trip to Bandurrias Island. Accommodation, tea and a great dinner at this enchanting and remote cottage where you will spend 2 nights. Breakfast and depart. This morning we'll enjoy 2 hrs ride visiting the Blue Lake 'Lago Azul' with its crystal clear waters and abundant fish life. The majestic peaks and stunning landscapes will not escape your attention! Picnic and relax on the shore of the lake. After lunch our ride follows deep and straight passes along the forest reaching the south part of this lake. Passing through the typical cold jungle, Valdivian-type rainforest with its ancient Alerce trees (Fitzroy Cupresoide) as well as other local 'giants such as the 'Coihue' and 'Arrayanes' (the cold tree). After leaving the horses in a safe place we will return back to the Island to enjoy the rest of the afternoon there. Timing: 15 minute motor boat; 30 minute walk; 1hrs motorboat crossing international lakes; 3 hrs private transfer from Puelo Lake to Bariloche. After a homemade breakfast we will take the motorboat and head to the east side of Lake Las Rocas. You will see the stunning beauty of Inferior Lake and the source of the Puelo River, a major river that flows into the Pacific Ocean. We arrive at customs and immigration post for Chile from where it is a short walk to reach Inferior Lake. Here, a motor-jet boat will take us across the lake and then down the river through a short rapid, the natural border between both countries. Before Argentine border formalities we will arrive at Lago Puelo National Park. From the far end of the lake we will take a private transfer to El Bolson where we will enjoy a nice lunch. It is possible, if the day matches, to make a quick overview of the traditional handy craft market. In the afternoon, arrive to the town of Bariloche. This trip can run as a group trip, with prices starting from $4,850 per person for a complete group. If you are looking to join a group or you are a solo traveller we will help to form likeminded groups of travellers. Please let us know your travel plans.